The birth of the Royal Air Force during World War I marked a pivotal moment in modern military and political history. With Europe’s western front frozen in a bloody stalemate of trench warfare, both sides sought some means of directly attacking enemy resources and morale. The new technologies of air power were used at first for reconnaissance of enemy positions for artillery strikes. By 1917 German bombers had begun raids on British cities, including an attack on London that killed hundreds, with eighteen schoolchildren among the casualties. Public outrage in Britain sparked a call for air defense and spurred political support for an independent air ministry. Prime Minister David Lloyd George and his minister of munitions, Winston Churchill, led the debates over how to shape Britain’s air power during the war. The immediate path to an independent RAF is a fascinating story of political, bureaucratic, and personal rivalries. By the end of World War I, the RAF was launching effective bombing campaigns on industrial and military targets in western Germany. It survived postwar retrenchment thanks largely to Churchill, who as colonial secretary gave the RAF special responsibility for enforcing imperial control in the Middle East, especially in the new League of Nations mandates of Palestine, Transjordan, and Iraq. The RAF helped to shape the way air power developed not just in Britain but notably in Germany and the United States. The massive bombing campaigns of World War II against civilian and industrial targets in major cities are rooted in this history. This compact book shows a master historian at work. In command of the archival sources, at home in all dimensions of the story, Richard Overy crafts an engrossing narrative of this turning point in our history. 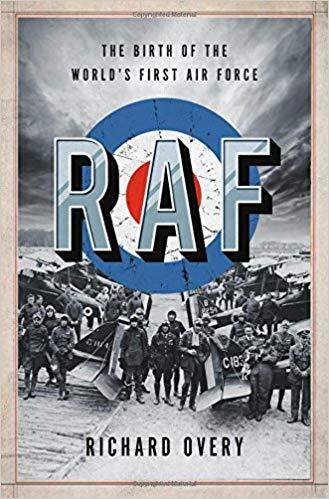 I really enjoyed the book RAF because I have read so little about the RAF but a lot about the American Air Force. This is a story that is not told a lot though because people do not often think about things when they were first created. The RAF had a rough started, but with the help of many people, including Winston Churchill, it was formed. RAF covers many different areas and people who helped or hindered the creation of the first independent air force. Part of why I really like it was because it wasn’t too wordy, and it reminded me of Doolittle’s book I Could Never Be So Lucky Again. This a great history, especially if you want something short but still informative and hard to put down.